What becomes a favorite app is personal, complicated, and evolves over time. Favorites can be brand-new apps that debuted this year, old standbys that you go back to over and over, or newly-discovered apps that have been around for a while. 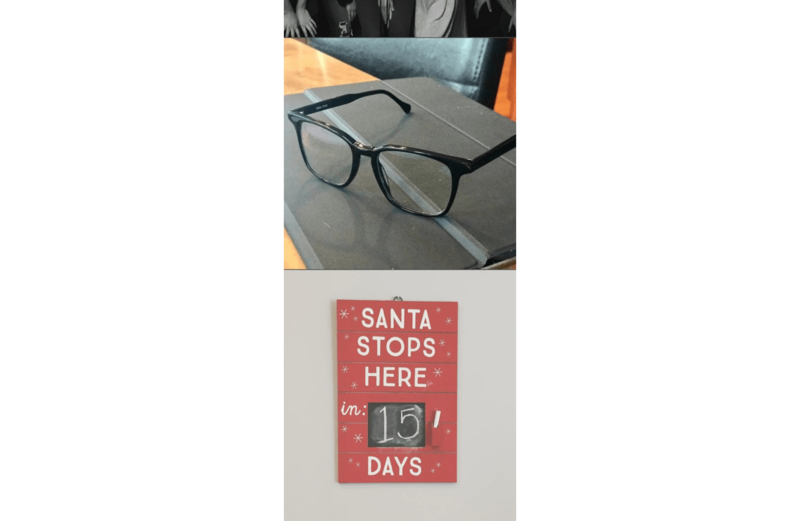 With the end of the year in sight Alex, Jake, and I got together and each picked a handful of our favorite Mac apps that we used in 2016 to share with you. A simple, beautiful notes app, Bear (free, with a subscription to unlock all features) came out at the perfect time: right on the heels of the official end of Vesper. Vesper was my favorite notes app for years, but that favor came at a cost. There was no Mac app, no Markdown support, no automation, and the app was very clearly not designed for any sort of longform writing. Bear entered the market with an answer to all of these shortcomings, and because I was already in notes-app limbo, I jumped on board immediately. Coming from a notes app that was iOS-only, Bear's support for macOS is a massive boon. I love never having to worry about whether my notes are on the device I'm using at any given time. 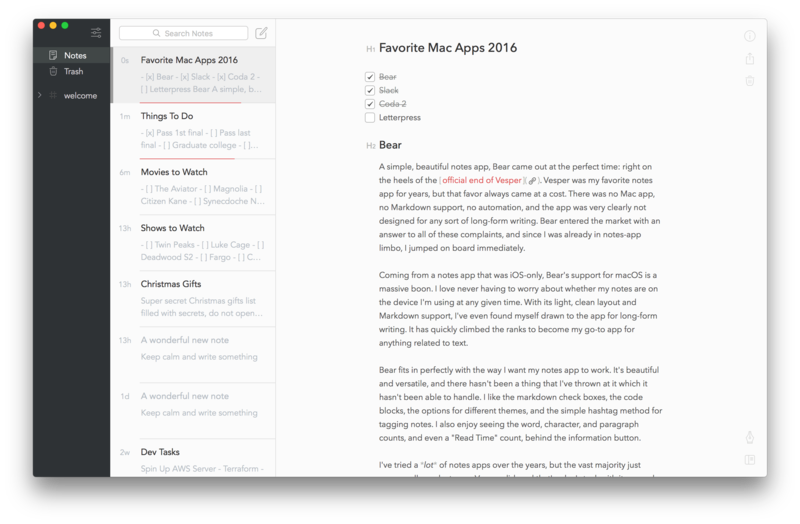 With its light, clean layout and Markdown support, I've even found myself drawn to the app for longform writing. It has quickly climbed the ranks to become my go-to app for anything related to text. Bear fits in perfectly with the way I want my notes app to work. It's beautiful and versatile, and there hasn't been a thing that I've thrown at it which it hasn't been able to handle. I like the Markdown checkboxes, the code blocks, the options for different themes, and the simple hashtag method for tagging notes. I also enjoy seeing the word, character, and paragraph counts, and even a "Read Time" count, behind the information button. I've tried a lot of notes apps over the years, but the vast majority just never spoke to me. Vesper did, and that's why I stuck with it so much longer than I probably should have. Something about Bear scratches that same itch. Particularly for a 1.0 release, Bear's developers have done a tremendous job so far. They have crafted one of my favorite Mac apps of 2016, and I can't wait to see where they take the app from here. The MacStories team has used Slack (free) as our main communication app for a long time now, but earlier this year my day job moved to Slack as well. With Slack everywhere, the app has climbed even higher among my favorite Mac apps. In particular I love the way Slack handles emoji. The ":name:" syntax for picking emoji is fantastic, and I wish that Apple would set up something similar on iOS and macOS (I know there are apps that do this but it's not the same). Furthermore, Slack's "emoji reactions" are excellent, and really make the app more fun. Using them forces me to wonder why Apple's implementation of the same feature in iMessage doesn't allow reacting with your choice of emoji rather than with a limited set of icons. My favorite aspect of Slack's emoji implementation is the ability to upload custom GIFs and images to a team's emoji database. This creates a unique ability for teams to mold the messaging app around their particular cultures. The MacStories Slack team has a much different set of emoji from my day job's Slack team, and I like it that way. The final aspect of Slack that I love is the excellent API. At work, I built a Slack bot which integrates with this API, and members of the team can interact with it by mentioning its username, or by using Slack's ‘Slash commands.’ In the Slack app for Mac, custom bot integrations can present miniature interfaces with buttons that users can interact with, and this has opened up a ton of possibilities for useful custom utilities. 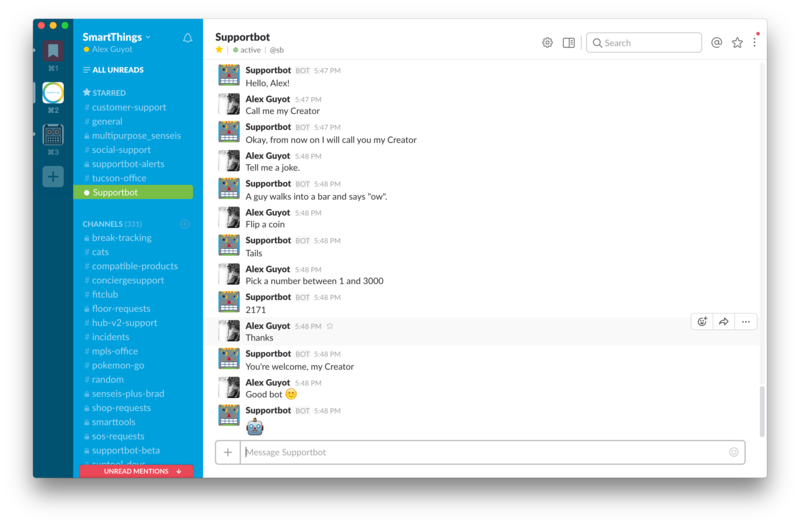 Building the bot has been a highly satisfying and fun side project. Between the emoji, the bot, and Slack's generally fun and inviting interface, the app has earned a special place in my heart this year. I expect it to be one of my favorite Mac apps for many years to come. Every programmer has a favorite coding app, and mine is Coda 2 ($99) from Panic. 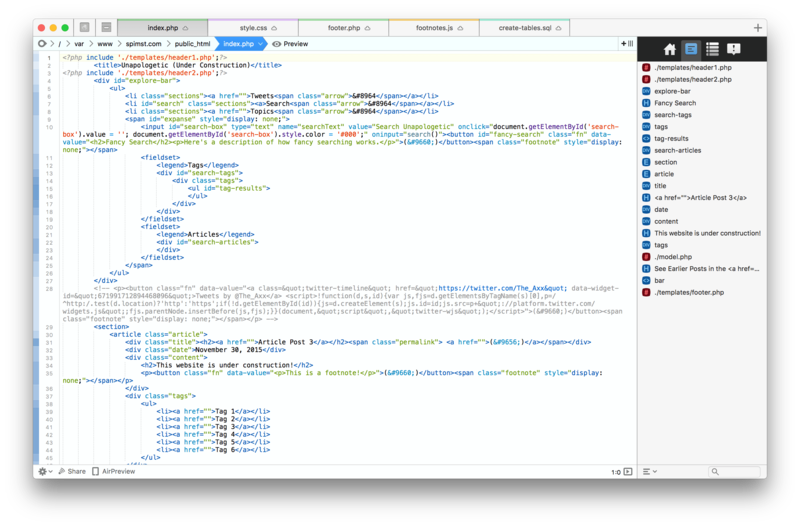 Most professional coding apps I've used have extremely heavy and cluttered interfaces, but the fantastic designers at Panic have crafted a simple and clean interface for Coda. While the app is focused mainly on web development, as a Computer Science major I've thrown a wide variety of languages at it and found it surprising versatile. Coda's customizable syntax highlighting and seamlessly integrated SSH capabilities have let me program anything from C and Python to Haskell. My aforementioned Slack bot, a server-side Node.js app, was programmed entirely using Coda. 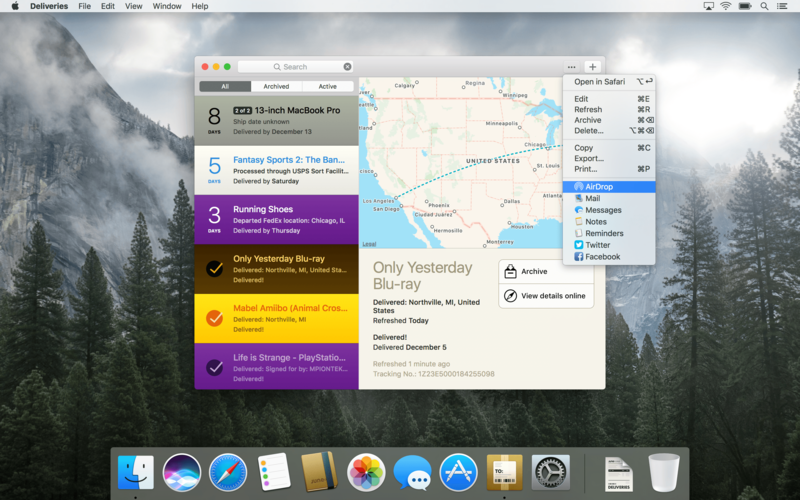 The experience was great, and I have nothing but praise for this Mac app. Coda 2 is the first app I've used that makes software development feel light and simple. It's like the difference between writing text on Microsoft Word versus Byword (or Bear!). It isn't the best fit for all types of programming – I still use Xcode and Eclipse when necessary (I've never been a fan of Sublime Text) – but I prefer to use Coda whenever possible. While the Mac version is by far the most powerful, Coda for iOS is solid app as well. With Panic Sync set up between them, it's great to know that I can jump in and make changes to my projects no matter what device I'm using at any given time. Letterpress (free) is a classic iOS word game released by Loren Brichter in 2012. It's one of my all-time favorite games on any platform, and one of the only games that I've found that has continued to keep me entertained for years. The only downside to the game was that it lacked continuous development under Brichter. In late 2015, however, Letterpress was sold to Solebon. They hit the ground running, bringing long-awaited and much-needed updates to refresh and improve on the original foundation. The first update was bringing Letterpress to the Mac. Having access to my favorite word game on my Mac has been great. It's a nice distraction from other work without having to shift attention to my iPhone. I also enjoy receiving notifications for new turns directly on my Mac. Admittedly, Letterpress for Mac is not the best macOS citizen. It lives in a fixed-size window and is basically a direct port of the iOS version, with no design changes to help it fit in on the macOS platform. While that is a shame, I expect Solebon will update the Mac version over time to address it. For now, its mere existence on my most-used platform is good enough for me. In the end, anything that results in me playing Letterpress even more often is a win in my book. 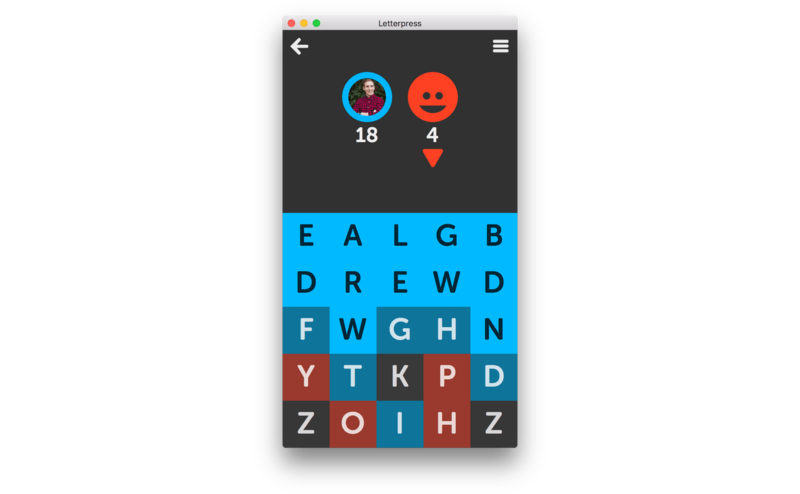 If anyone reading this still plays and wants a challenge, my Letterpress username is ajguyot. Feel free to start a game, just leave a note in the chat saying you're coming from MacStories! When I made the switch to Upthere back in August, I was working primarily on iOS without the need for file syncing between all my devices. Now that I’m in the full swing of university life, and work on iOS and macOS, having a cloud service that’s clean, quick, and reliable is more important than ever. That’s where Upthere Home comes in. Upthere has multiple apps, but my favorite is Home, which allows me to type in what I want, see the results, and select the right file faster than any of its competitors. I prefer it to Finder because its unique file-organization system (no folders!) fits better with my preferred work style. With my synced photos and documents side-by-side, it truly feels like all my files are right where I need them. Aesthetically, it’s hard to beat Upthere Home’s design. Upthere Home’s simple white and black color scheme gets out of your way and puts your content – the most important stuff – first. 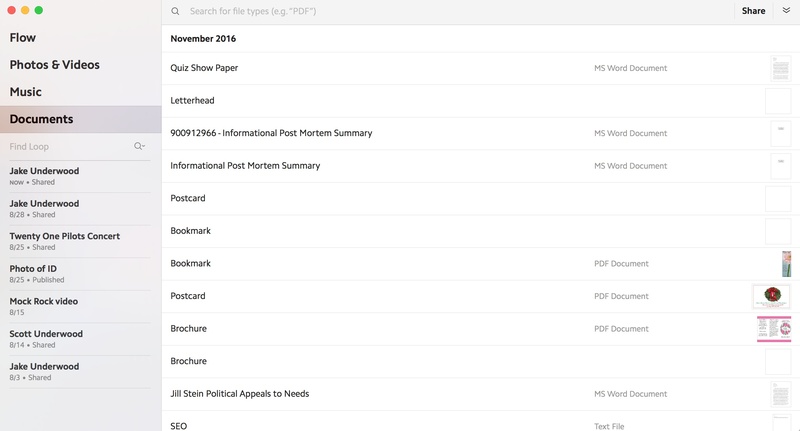 The app emphasizes search for finding files with an exceptionally fluid experience. Because Upthere is a paid cloud storage solution, its Mac app doesn’t do much without the subscription. However, if you decide to make the switch (I have a full review of the apps and service coming soon), I think you’ll be pleased with the interface and features that Upthere Home has to offer on the Mac. I’m not that active on Instagram, but I enjoy using the service to see how my friends are doing. Because I don’t always want to open the Instagram app on my iPhone (and don’t even get me started on the iPad), I’ve been using Flume (free) as my Mac Instagram client. The way Flume handles the photos in your feed is fundamentally different than Instagram's iPhone app. Instead of showing you the photo followed by the like, share, and comment buttons and the comment section, Flume simply displays each image one after the other. I prefer this to the iOS app because it gives me just the details I want while browsing. If I want to view more information or like a photo, all I have to do is to click on it for those options. I’m also usually pleased to receive Flume's notifications letting me know that something new has been posted in my feed. Because I follow a relatively small number of accounts, this happens often enough that it draws me in, but not so often that it’s as distracting as it would be with another service like Twitter. By far my favorite feature of Flume, though, is that it is conveniently placed in a thin, long window that only takes up a small portion of the screen. This design decision is incredibly smart, as it allows me to work on other things while also keeping an eye on what's going on in my feed. In terms of quality, I have no hesitations about putting Flume next to social media apps like Tweetbot. If you love Instagram, Flume is for you. What can I say about Tweetbot that hasn’t already been said? 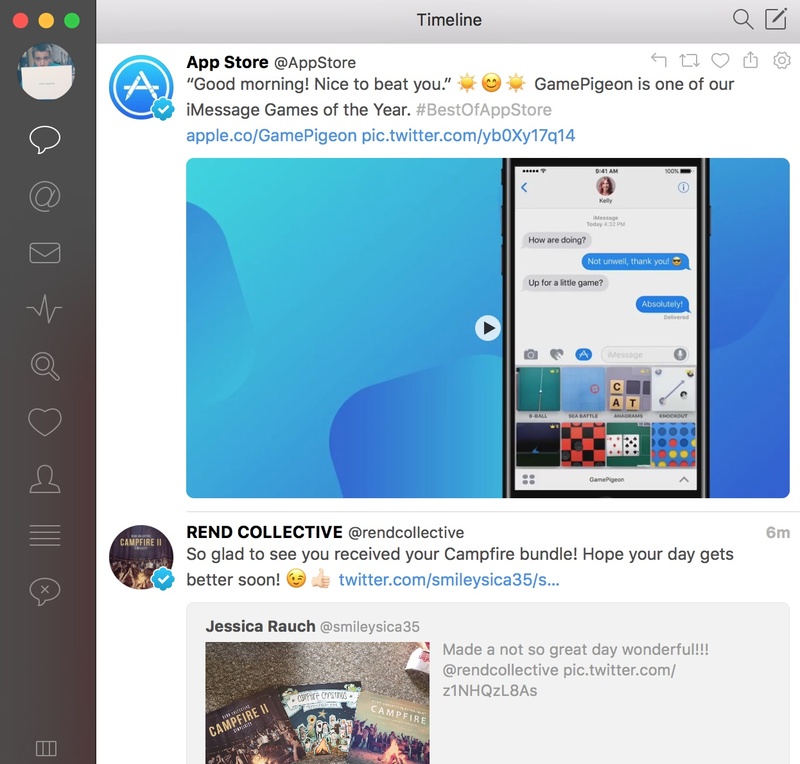 Tweetbot ($9.99) is, without a doubt, my most used third-party Mac app of the year. Whenever I’m trying to be productive in apps like Slack and Bear, I feel the incessant desire to check Tweetbot. Even now, as I write this on my iPad, I’m periodically checking Tweetbot on my Mac. Tweetbot is more than just a better Twitter client – it's a lesson on what it means to be the best app in your category. Tweetbot is exactly what I need in a Twitter client: clean, smooth, and fast. With Twitter on the web or on iOS, I always feel like it takes too long to get to the content I want to see, while Tweetbot has me launched and looking at new tweets almost immediately. What I appreciate the most about Tweetbot is its navigational ease. I can get from my timeline to my mentions and even to my mute filters in just one click. I can also quickly like, reply, or retweet, saving a lot of time. With Tweetbot on all my devices, I'm able to pick up on my timeline exactly where I left it, a feature I took for granted after retrying Twitter's own app a couple of months ago. If you haven't given Tweetbot a try, this is something that you won't truly appreciate until you see it for yourself. MindNode Pro ($29.99) is my favorite way to get my thoughts out of my head and organized the way I want. Although it sounds like a simple task, I've always struggled to find the right software for this. Since using MindNode, I've made it a habit of organizing my thoughts in the form of a mind map. 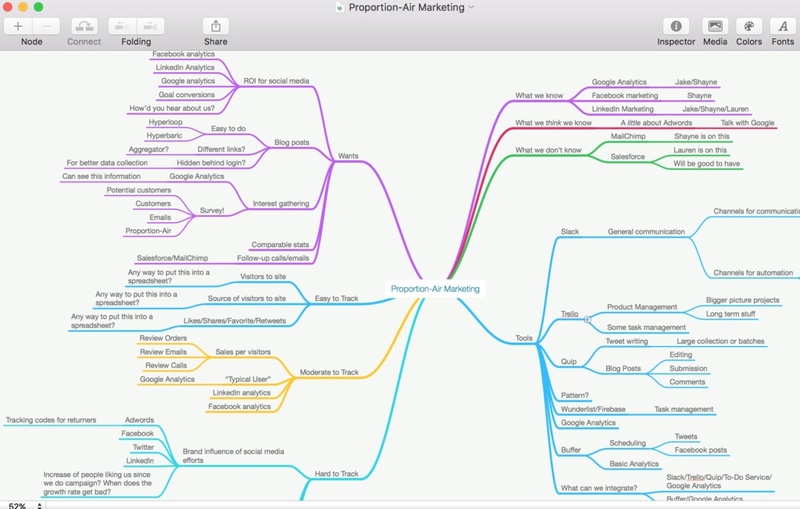 Building mind maps is simple – from a central idea, you create topics that branch off of the main one as far, and in as much detail, as you'd like. The end result is a colorful web of lines and text that you can trace from the main idea, down whatever path you want, while still viewing the context of the broader themes. MindNode makes creating mind maps easy with trackpad swipe controls and a convenient 'Add' button that’s always nearby. As you add branches, MindNode even helps organize your mind map visually by evenly spacing everything. With customizable options like the ability to add media or change theme colors and fonts, it’s also easy to give your mind maps your own look. I wish I could say more about MindNode, but it’s the app’s simplicity that makes it shine. I've never been confused by MindNode. Instead, I've always felt I could insert my thoughts into it without the app getting in the way. With versions on iOS and watchOS too, MindNode on the Mac completes a great selection of apps. Ulysses ($44.99) unified my writing across iOS and macOS this year. Previously I used different text editors on each OS, and while I would never say never, I can’t imagine ever going back different apps on each platform. Even though it’s a small change, the familiar organization of my documents and UI eliminated a friction point I appreciated leaving behind. 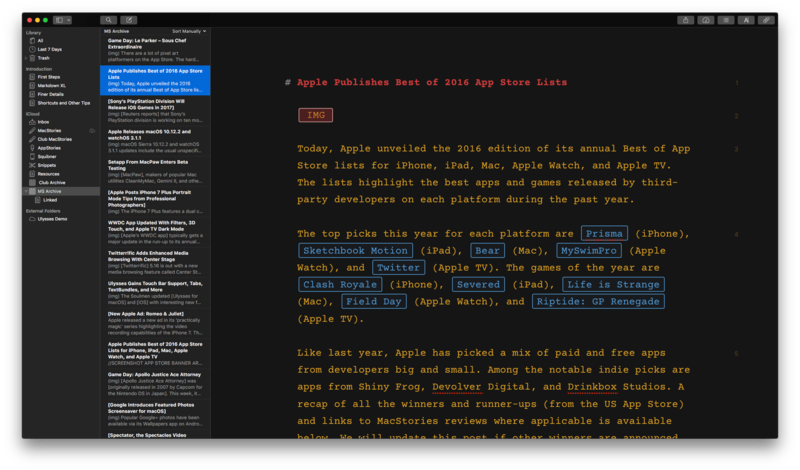 I was initially a little turned off by the way Ulysses abstracts away Markdown syntax for things like links and images. That took getting used to, but it’s an improvement overall because it makes articles easier to read, which, in turn, makes editing and proofreading easier too. Most of the time I’m in Ulysses’ third pane writing in Courier Prime with a dark mode theme that Federico designed. I appreciate the ability to add keywords, notes, and images to articles, but they’re not features I use every day. The feature that’s made the biggest difference is Ulysses’ versatile export functionality. I regularly preview articles as HTML when editing and proofreading to get a different perspective on my prose, export articles as MultiMarkdown that I upload to GitHub where they’re available to other MacStories team members, and, when an article is finished, I publish to WordPress from within Ulysses, complete with a category and tags. There is no other app that I’ve spent as much time in during 2016 as Ulysses. Both the Mac and iOS versions hide powerful features just out of sight from a simple writing environment, which minimizes distractions, but also accomplishes the heavy lifting when needed. My image editing needs are light. As a result, a monthly subscription to Adobe’s Creative Cloud is more than I want to spend. Instead, I use Pixelmator ($29.99) for things like many of the screenshots you see on MacStories. Pixelmator makes quick work of tasks like adding a little transparent padding to an image or creating a grid of iPad screenshots for my Game Day column. The layout tools in Pixelmator make it extremely easy to work with Photoshop files too. 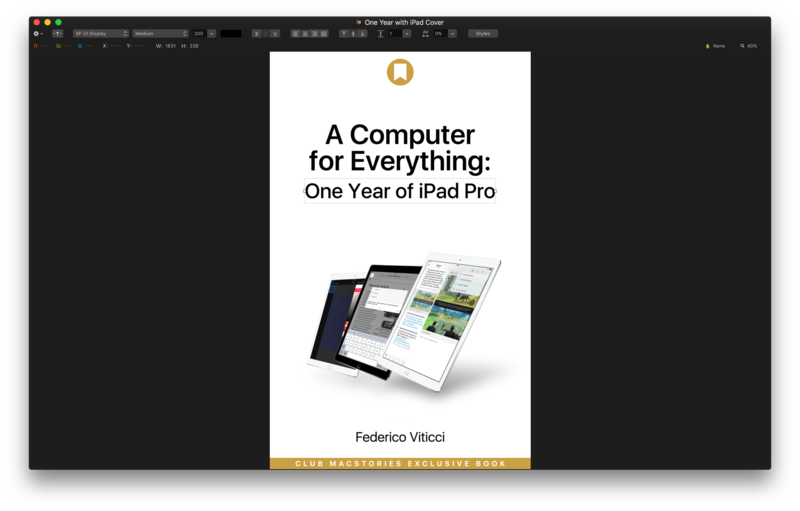 The screenshot above started as a Photoshop file from a past project that I adapted to create the cover for the ePub version of Federico’s story A Computer for Everything: One Year of iPad Pro that’s available to Club MacStories members. As with Ulysses, I like that I can use Pixelmator on my Mac or iOS devices, which makes moving between platforms easier. In addition, even though I barely scratch the surface of the sophisticated image editing tools available, Pixelmator for Mac is a bargain at $29.99. 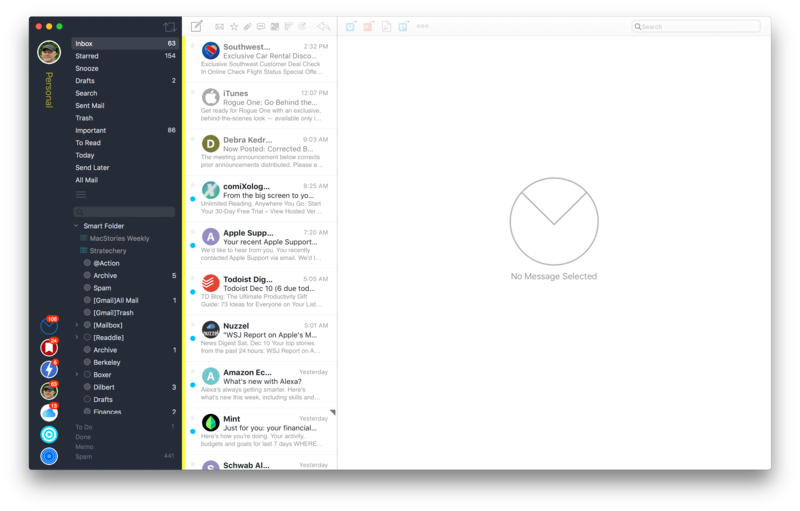 I’ve used a few different email clients in 2016, but Airmail ($9.99) has stuck the longest because it works well with how I use email. I want to be in my email client as little as possible. To accomplish this I use two features Airmail offers on macOS. The first is VIPs, which I use to surface email from people it’s important for me to respond to right away. VIP notifications are a great way to limit email interruptions. Even more important, though, are the services and apps I can connect to Airmail. The list is long, but the ones I use most often are Todoist, Dropbox, PDF Create, and Trello, but you can also connect to apps like 2Do, Fantastical, Things, OmniFocus, and others. 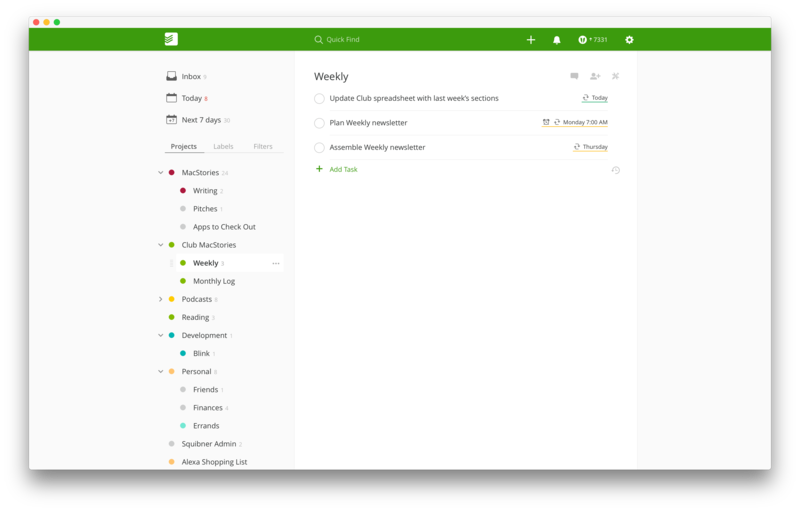 By far the most important of all is Todoist, which helps me get information out of Airmail and into my task manager where I can assign it a project, deadline, and other parameters. The other feature of Airmail I use a lot is filters. Just above your list of emails is a row of buttons to show unread messages, starred messages, messages with attachments, and conversation threads, as well as buttons to jump to a particular date, order emails in the list by various criteria, and show all messages from a sender. I try to keep on top of my email, but when I get behind, the ability sort messages in so many ways helps me work through them quickly. Todoist’s (Free, $28.99/year for premium features) strength lies in its being everywhere, including the web. Because it’s on so many platforms, the design of its Mac app sometimes feels a little un-Apple-like, but I can live with that in exchange for its power and flexibility. Todoist makes it dead simple to get tasks into the app. I regularly send snippets of text or URLs to Todoist with the system share sheet, for instance. There are also keyboard shortcuts for nearly everything in Todoist, which makes adding, editing, and filtering items a snap. My task management system is fairly simple. I have a handful of top-level projects, which each have a few sub-projects. I take advantage of Todoist’s natural language recognition to input dates in plain English and hashtag syntax to assign projects without navigating to the projects first. If I don’t get to something, rescheduling it for a later date is also easy. I can pick the date suggested by Todoist’s built-in AI or use one of the other choices offered. Also important to the way I work is that Todoist’s UI feels like an outline, which is how I take notes and think about projects. The clear, color-coded hierarchy lends a visual clarity to projects that is appealing to look at and simple to recognize. I have used Deliveries ($4.99) since it was a Dashboard widget. My use of it ebbs and flows depending on how much online shopping I do, but it’s never failed to work for me. Whether I’m dropping in order numbers from Apple.com or Amazon or tracking numbers from any shipping company I’ve ever used, Deliveries gives me the details about my shipment, where it is in the process, and when it is expected to arrive at my home. I particularly like how I can add order numbers for websites like Amazon and Deliveries pulls in the order details from the web so I don’t have to type a description. You may have noticed a theme in our picks. Nearly every one has an iOS and macOS component and in most cases incorporates almost the same features in both versions. We didn’t plan our picks that way, but we each spend so much of our time on both platforms that there are few Mac apps that any of us could call favorites if they weren’t also on iOS. We find ourselves at a point in the development of both OSes where moving between macOS and iOS can be done seamlessly. That’s something that we’ve all come to appreciate as we switch contexts throughout the day without compromising our productivity.